W.A. Young is a prolific composer for opera, ballet, orchestra, piano, solo strings, and solo guitar. His musical works can be described as tonal and lyrical. He is presently the most published living American composer of major opera arias for all voices. 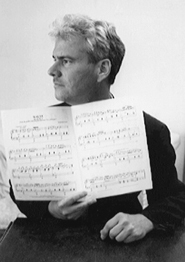 Young received occasional advice on opera composition from Samuel Barber in the year before he died. Among Webster Young's composition teachers was Charles Jones (a close friend of Darius Milhaud). Young's family is related to Otto Harbach, the prolific Broadway lyricist of the 1920's and 30's. Young is composer and librettist of six operas, from 1994 to the present. Before his opera work he was the most prolific ballet composer of the 1980's. Two PBS-style TV documentaries have highlighted his work in both mediums. He was trained in composition at the Juilliard School, the Manhattan School of Music, the Aspen Music Festival, and the University of California, Berkeley and Davis campuses. As a public performer he is a pianist, violinist, and conductor. He is a writer of essays on music, some included here. To sample, buy and print sheet music at Music Notes for the following instruments and voices, click here. To sample, buy and print sheet music at Free Hand Music for the following instruments and voices, click here.